BERNARD BILIS, France’s King of Cards, Teaches his Favorite Sleights, Techniques and Routines. 27 routines, including a full professional show, underground techniques and essential sleights. Top level magic from one of the World’s leading sleight of hand artists. PASSION is a masterwork. It’s more than a masterclass, as there are things within you will take with you for the rest of your career. There are things in here you may not be able to perform, more likely because you are not willing to devote the time and effort Mr. Bilis has. He has made a life with magic, learning from the very best in the world, and now, gleefully passing on to anyone willing to spend a pittance, all those essential sleights and effects that could well take your magic to a whole new level. It won’t do it overnight.. but it has the innate power to do it one step at a time. My thoughts on this 4 DVD set are summed up in the first sentence. Everything I write, from here on, comes from this perspective. I’m going to try to explain the basics of each effect to give you a better idea of what you’re getting for your money. Bernard has performed on TV in France for the past 19 years running. The son of a Russian actor and a mother who’s family are restaurateurs, Bernard began magic in his teens, quickly forming a lifelong friendship with another aspiring young magician.. Juan Tamarez. As you’ll learn throughout the DVD’s, he has also friended some of the most important names in the history of magic. A portion of the first two DVD’s are of Bernard performing for a live audience at the Duecitanea Hotel in Penela, Portugal. You get to see each of the effects performed live before the explanation portion begins. This section is complete with subtitles, which isn’t a problem since all the explanations are taught by Bernard in English. Subtitles are available in English, French and Spanish. Cut Card – Mike Caveney effect. First, create a gimmick. Everything is taught. Force a card with a second deal, This signed card is cut into in front of the spectator. The card is then restored..
Four Jokers – Three red Jokers and one blue Joker are used, along with one red and blue back gaff. Red Jokers change to blue. then red and blue, then all blue, then all red. Lastly, the spectator chooses one of the Jokers and it alone changes to blue. Very visual. also teaches a convincer move. Rising Sun move.. A card is shown, inserted into the middle of the deck, and then reappears on top of the deck. If you can do a tenkai palm .. you can do this. Go To See If I’m There… Quick effect. A chosen signed card changes places with a card on the table using the rising sun move. Escapology Three chosen cards escape from a silk in an increasingly more difficult manner. uses a double facer, a black silk, and a tad of black art. Nice effect usually reserved for coin work converted to card magic. One of the more technical effects that utilizes signed cards and classic magic from the past in a modern presentation. Visiting Card.. Uses a very slick gimmick to give the illusion a card has been torn. This is actually a prediction effect that uses very detailed thinking and even more detailed explanations. Invisible Palm.. Inspired by Larry Jennings. Very beautiful effect with four Aces. Classic effect. Technically the most challenging but perhaps the most rewarding. Uses a couple of Marlo moves, well explained. Impossible Center Deal.. A gambling demonstration for the lay audience. Boxed Center Deal… Uses another slick gimmick to perform a quick visual. Well taught. A card placed in the center of the deck and then boxed is snatched out of the boxed deck. Interview… Bernard is interviewed at the end of each DVD by the executive producer, Luis De Mateos. This interview covers his start in magic and early influences. All interviews are approx. 20 minutes and well worth a listen. Spectator Cuts The Aces – Several fairly simple cuts brings the spectator to the four Aces. One of my favorite effects. General Card – Ascanio inspired effect. Good follow-up to Spectator Cuts The Aces. Four Aces change to four Kings… and back to four Aces. One of the more simple methods I’ve found to perform this change. Billy The Kids – Thought-of cards and thought-of numbers coincide in this magical story of famous outlaw Billy The Kid. Bernard also teaches the psychology behind some of the moves. Ambitious Card – A Ambitious Card routine with a blank deck and a blanked signed card. The climax is totally unexpected, as the blank signed card transforms into a regular playing card inside a glass jar… complete with the spectator’s signature on the face. Very original. Sponge Ball Routine – Bernard combines classic sponge ball moves into an original routine resembling real magic… in the hand of the spectator. You don’t need a hundred sponge balls to do this one.. only three lemon size balls and one grapefruit size ball. Interview… Part Two covers many different questions, about his effects and influences, conducted by Luis de Mateos. Palming – Not just demonstrations, but teaches how to palm properly, even if you are not comfortable with the basics. Tenkai palm, side steals, top steals, replacing palmed cards in or on the deck. Also teaches a cool effect featuring a palm, and moves involving a pass that allow you to segue into some really nice magic. Pass – Bernard demonstrates in great detail all the moves necessary for a successful pass. For those of you who feel the pass is essential, this section is a must-see, full of the small details that make the larger ones work. This is my least favorite sleight in all of card magic… Way too much for the audience to see. Bernard teaches the Larry Jenning Pass too, which is, in my opinion, considerably better than the classic pass. Same for the Charlie Miller Pass, which is a pleasure to watch in the hands of Bernard. Watching a demonstration of a Marlo sleight helps the average magician understand the awesome skill level of Mr. Bilis. Double Lift – This section if full of small wonders, including the “double lift from the center with one hand” and the “pirouette” move he and Tamarez learned as youth. Strip Out – This is a double screen teaching of the Strip Out Shuffle. It uses a half-deck strip out combined with a convincing false shuffle. Nice. Vernon Transfer – Very versatile move, as many advanced magicians already know. Bernard teaches the basics and variations, then uses the VT to perform the Ace Monte, a killer effect. I only wish in my dreams of dreams I could do this… He also performs the Poker Deal using the VT and demonstrates its power again. I am sooo jealous. Bilis Switch – Imagine John Bannon’s Paint It Blank, except using a sleight. Same impact.. but can be done with a borrowed deck. This is exactly what Bernard says it is… a switch of one card for another right under the spectator’s eyes. Very good tutorial, plus the Envelope Switch prediction effect, which is a straightforward switch of any chosen card for a duplicate card of the card in the envelope. Red Black Aces switches different colored Aces in a quick ditty of a trick. Every effect on this DVD is well-suited for an audience as well as fellow magicians… You’ll fool ’em all. In the Disc 3 lecture, Bernard talks about magicians like Fred Kaps and Dai Vernon, and how they influenced him. What he doesn’t talk about is how he influenced them, which he obviously did. He admits to being very influenced by Marlo and Larry Jennings, and has interesting personal observations to tell. Open Prediction – A predicted card can’t be found by the spectator.. then it’s found upside down in the deck. Classic Bilis, using a strip out, palm, and a fancy-do (but easy) add on to make everything work. Voodoo – Slick.. Slick. A card named by the spectator is removed from the deck. Its mate is found to be upside down in the deck. The corner is torn on the selected card. Its mate in the deck is found to be missing its corner. Lastly, the selection is burnt.. and the card in the deck is found to be burnt in the same manner. One of the rare Bilis effects that requires a prepared deck… but worth it. Triumph Spell – A spelling prediction effect with a Triumph theme. A little of this.. a little of that, and ultimately one upside down card in the deck reveals the location of a selected card. Great effect if you like Triumph with a kicker. Running Gag Aces – This is just plain showing out. Three cards selected by the audience are placed in different parts of the deck. One by one, each of the four Aces are revealed to be face up in the deck – and then lost in the deck. The three selected cards are then found face up, and together, in the deck. Lastly, the three selected cards are found individually between each of the Aces.. with an additional flourish or two for good measure. Four of a Kind – The four Aces are put in the deck at four different locations. The deck is spread to show the four Aces have vanished. A number is named and the four cards matching the number are removed, shown, and placed on the table. Somehow, through sheer slick handling, Bernard makes the Aces replace the number cards.. and the number cards reappear inside the card box lying on the table. This is magic beyond my dreams. Absolutely NO hyperbole. Three Card Monte – A Martin Lewis effect. 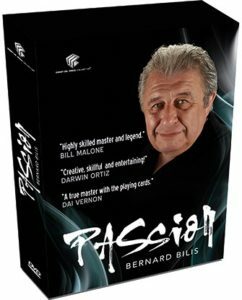 Bernard performs this in front of an audience.. using jumbo gaffed cards in the hand. Since these are jumbo cards, and the effect is performed at a distance, I think you can create your own gaffs. A great effect for street performers. Rope Routine – Something to show Mr. Bilis is not all about pasteboards. Performed again in front of an audience, this is a very well-taught routine that includes a linking ring type move that will even fool some magicians. Camera angles from above show all the essential stuff. The last of the four lectures is a 45-minute talk about what should be important to you, how you should learn and the benefits of a teacher. All the lectures are in-depth thoughts from a master magician, and you should not EVEN consider skipping through the lectures to get to the next effect. Don’t just strive to understand the magic… strive to understand the man behind the magic. This lecture ends with Bernard and Luis doing something that’s very special to the Bilis family.. something that is magical beyond the magic we understand.. PASSION is deep stuff. This is NOT something you’ll breeze through, learn a move or two and maybe three or four effects.. and dutifully skip on to the next hot DVD. This is heady magic. This is magic beyond our present understanding, but not beyond our ability to learn. When discussing the Pass, Bernard casually mentions you will work about six months to develop a good one. Much of his magic follows the same premise. There is nothing ‘self-working’ here. Only magic from one of the very best magicians in the world. Production of these DVD’s is first class in every way. Essential Magic Collection always exceeds industry standards, in part because Luis De Matos is executive producer and David Britland is the magic consultant.. There are multiple camera angles, overhead cameras, and split screens. Total running time is over 8 hours. Price: $150.00 Available from dealers carrying the Murphy’s Magic line..
And the first-ever America’s Got Talent: The Champions winner is … Shin Lim!